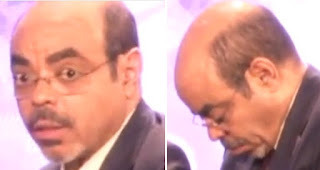 May 18, 2012 — Ethiopian despot Meles Zenawi was humiliated in the presences of world leaders after accredited journalist Abebe Gellaw interrupted his speech and called the premier a dictator and accused him of committing crimes against humanity. "Meles Zenawi is a dictator! Free Eskinder Nega and all political prisoners! You are a dictator! You are committing crimes against humanity! Don't talk about food without freedom! We need freedom, more than food! We need freedom, freedom, freedom, freeom! ", shouted Abebe Gellaw. During his protest, Meles appeared visibly shocked and bewildered, as the center of attention quickly shifted towards Mr. Gellaw. As he was being peacefully removed by security officials, one of Zenawi's bodyguards had threatened to kill him in Amharic. Despite being briefly questioned by the police, no files were charged against him. 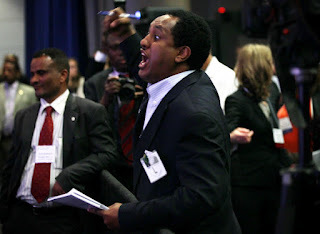 Meles, who is approaching 21 years in power this coming May 28, was invited by President Barack Obama, along with three other African leaders, to a symposium on food security at the Ronald Reagan Building in Washington D.C.